For Howl-O-Scream coupons/discounts, see this post! If you think you’ll make a few visits this summer, spring for the Fun Card ($66.99) for all but one family member (obviously if you have a preschooler, get them the free Preschool Pass!). One adult – whomever will be going most frequently – should probably purchase an Annual Pass ($119.99 full price) that comes with free parking. Skip to the pass section for more info about deals on passes. Cheapest County Parks and Recreations Theme Park Tickets – Several Parks and Rec departments in the Richmond area sell discounted tickets. For instance, Henrico County offers Busch Gardens tickets for $49 ($39 for ages 3-9). Valid through September 3. Must purchase at the Parks Dept in the Human Services Building, and bring exact cash or a debit card. Cheaper Ticketmaster.com – Purchase a one-day ticket online for $54.49 for an adult, or $44.49 for a child, including fees. Valid through October 28, 2012. Coupons: Check Chick-fil-A (Hampton Roads and Richmond) and Food Lion (mid-Atlantic) locations for $12 discount coupons. Food Lion MVP discount – Show your Food Lion MVP card at any park admission window and get $12 off a single-day ticket. Offer ends June 30, 2012. Discovery Ticket at Costco – Valid for Busch Gardens and Water Country visits for 7 consecutive days, and includes free parking. Visit any Costco in Virginia, DC, Maryland or North Carolina and pay only $62.99 for a Discovery Ticket, a $22 savings off the regular price. complimentary admission. Either register online or show ID at the park. This offer is not valid during Christmas Town. For your service and sacrifice, we thank you. FREE Sesame Street Forest of Fun Preschool Pass – (For Virginia residents only). For the third consecutive year Busch Gardens is offering kids ages 3 through 5, a Free Sesame Street Forest of Fun Preschool Pass, valid for unlimited admission through Oct. 28, 2012. Must register online and provide proof of age and residency. Finally, follow Busch Gardens on Facebook and/or Twitter to hear about new ticket discounts and park special offers! Do u know if BG offers a senior discount? I didn’t see it on their website or here. Heather, you’re so welcome! Yay for saving $$ 🙂 Hope you have a fabulous time! I tried the one year pass discount and it didn’t work. Do you have any more I could try? Do you know if i can get coupons for Busch gardens Williamsburg at Costco’s in England ? Good morning, my name is Josh Garcia and I, my active duty son as well as my wife and older son recently spent a marvalous day at your facility. We encountered some confusion when we checked in to retrieve our tickets to enter the park. We approached the ticket counter with some printed passes that my active duty son aquired on line as informed by his unit, and we were informed that the free passes were only for my active duty son, and not applicable to the three dependents as stated on your site. http://www.richmondbargains.com/2012/05/busch-gardens-williamsburg-ticket-and-pass-discounts-2012/. What is meant by “as many as three direct dependents”, I ask because I had my retired military ID and so did my wife, but we were told that the only member that was eligiable was my son. The rest of us were required to pay $60.00 plus change in order to enter. If you will please provide some understanding so I may pass this along to other members of my son’s unit to avoid further complications to other military families that may find themselves in the same situation if not properly instructed. Thank you. I may be reached at (910) 554-6455 or via the email provided. This is in response to Josh Garcia: You are retired military and you don’t know what a “direct” dependent is? A direct dependent is a dependent that is on the servie members page 2. It meand that the military acknolages these dependents are under the direct care of the service member ie. Children, wife, sibilings that live in the service member and are registered to recieve benifits under their care. Do you know if there is an expiration date on the Pass discounts (save $20 on a yearly pass)? Due to work obligations, I was planning my first in October. With the passes valid one year from the date of purchase, I would like to benefit from a full year, however, if the pass discount will be expiring soon, I may purchase in advance to take advantage of the discounts. I’ve emailed Bush Gardens guest relations and haven’t received a response. I also called the number provided on their website and when you select the option to inquire about tickets, there is a message saying a high number of phone calls are coming in and to check the website, then drops the call. Thank you in advance for any insight you can provide. I will be visiting BG next weekend. Any suggestions on how I can obtain cheap/discounted tickets? I will have 2 adults, 3 children and 1 senior with me. Thank you so much!! You just saved us $80!!! Woo Hoo!! Thanks. You just saved us $100!!! We are coming from Texas and will be there the last week of September. There will be 4 adults. Are there any discounts available for Busch Gardens and Historic Williamsburg? We are leaving for busch Gardens in the morning and doing 1 1/2 days in the park. Is the fun card our best option. 2 adults, 1 child 3-9, 1 child 15. Yeah, if you’re going two days you might as well spring for the fun card, unless you have access to a Costco for the $63 Discovery pass. If you’re youngest is 5 or under and you’re a Virginia resident, make sure you sign them up for the free Preschool Pass! Are their any discounts or coupons for parking? Any suggestions to avoid parking there? Or is parking there the only option? Thanks! Also, can you bring water bottles into the park and snacks? My husband is active duty and we are planning on going to howl-o-scream this weekend. I know that you don’t get in for free for Christmas Town but do you still get in for free for Howl-O-Scream or should I have him buy tickets? When I type in the code bgwbk it says its invalid is there a diff code for the 20$ discount? ??? Chris – yes the BGWBK has just ended. Try BGWWENDYSHOS to save $20! Do you know the code to receive a discount for the 1 year pass? When I enter the promo code “BGWWENDYSHOS” it does not apply to the 1 year pass. Thanks x 7!!! Thanks. The $20 BGWENDYSHOS code worked. how much would a ticket be if my cousin has a military discount and she is buying it for me? wondering why a busness as large as bush gardens will give active duty personnel a discount which is great but not to retired members we done our time and saw our wars guess since we are gone we are forgotten. Sam – Perhaps you are overlooked by BG in this promotion, but I promise you are not forgotten. Thank you for your service to this country! we don’t twitter. how do we find out about the $5 Christmas town discount tickets? 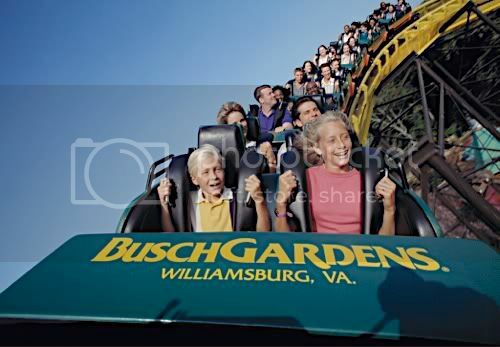 Going to Busch Gardens in Williamsburg Oct. 12th. The BGWWENDYSHOS didn’t work. Any other discount codes available? Thanks! Does the discount code show up after you have entered all your info including CC info? No, you should see the discount reflected before you even put tickets in your cart! Sometimes it doesn’t work right away (very scientific answer, I know) – try going to different page on the Busch Gardens site and entering the code again. Thanks for this info just printed my ticket using the Wendys code..so glad I saved 20.00!! I have tried both BGWUPFC and BGW1YR12 (for $20 an annual pass) in the Promo Code section, but it won’t take either one. What am I doing wrong? just used BGWWENDYSHOS, it worked like a charm…save a hundred dollars! thank you! Me and my husband was wanting to go to BG this saturday he is active duty, i know he can get in free but what about me as his dependant? Hi, we are planning to bring our 4 year old daughter to Christmas Town at the beginning of December. We are travelling from MD and will be staying in a hotel. I’m sure I won’t be lucky enough to get the $5 tickets that were sold last year. Do you know of any discounts on Christmas Town tickets? With gasoline and hotel, I’d love to save somewhere! Also, I read that the annual passholders get a discount on their tix. If we have friends in the area (who will not be going to BG with us) could they buy tickets for us at a discount if they are annual passholders? Thanks so much! If my mom and dad are retired and I have my own military id and I am 17, do they have to be with me when I go to howl-o-scream or can i just show my own? Who knows of any season pass discount? Looking to buy around Christmas – for Christmas presents. Hi, Are there any discount codes yet for 2013 for single day passes? Do you know if there are any discounts for Busch Garden Fun Card or Season Pass? Richard – There usually aren’t any discounts for the Fun Card. As far as I know, there are no current discounts for the season passes either. If I hear about any, I will post them! Do I need an ID to enter howl-i-scream? Can it be college ID?